I think I have fallen in love with spats. THEY ARE ADORABLE. I knew of the existence of spats somewhere in the back of my mind. I had a friend in high school who was quite enamored with them. I myself love saying "spats", and am fond of the song from the musical CATS about Bustopher Jones and his white spats. However, I've largely forgotten about spats, giving them little to no thoughts. 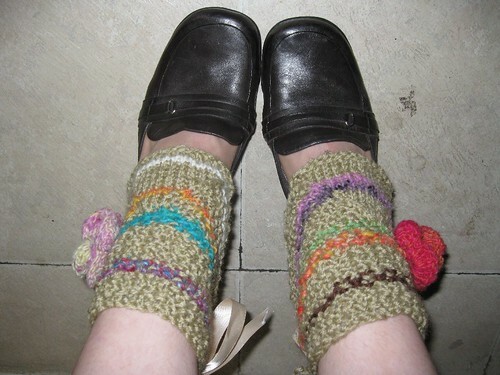 Spats achieve a similar effect as legwarmers in the 80's: Making feet look really comfortable. 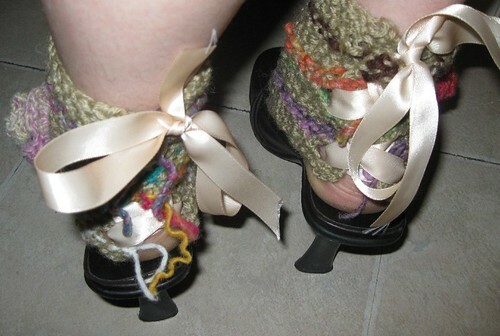 For some reason, a bunch of fabric around the heel of a foot makes it look comfortable to me, and comfortable = adorable. Spats could be an agreeable addition to hooping costumes, as they accent the feet while still allowing one to be essentially barefoot if they so desire. 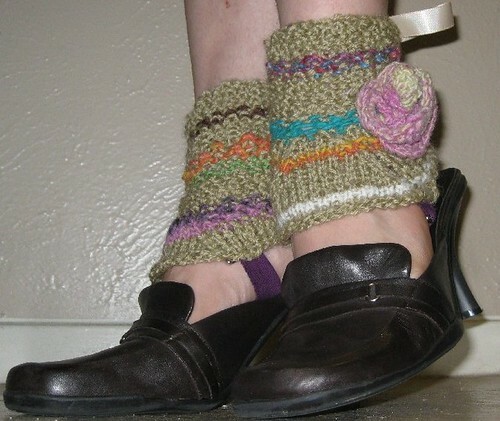 They are also a nod to the whole fuzzy legwarmer phenomenon, without being friggen' fuzzy legwarmers. There are enough different designs out there for spats that it would not be too difficult to make my own. So I spent the past couple of days going about the task of playing around with making spats. I rounded up a bunch of my scraps of yarn and fashioned it into spat-like shapes. I am quite pleased with my initial efforts! I put them on and pranced around the living room a bit, getting Green's opinion. (He approves.) Incidentally, it is impossible to wear spats and not prance. I should know. I've been wearing my spats for a couple hours now and I have pranced everywhere, even to the bathroom. I dug out my only pair of shoes with heels, because I feel that spats deserve shoes with heels, and I took a bunch of pictures. Given my natural inclination to want to try things on before I actually finish them, the straps on the bottom are only safety pinned on right now, and the yarn ends aren't woven in. Mind you, that has not put a halt to my prancing. I can teach you how to knit! 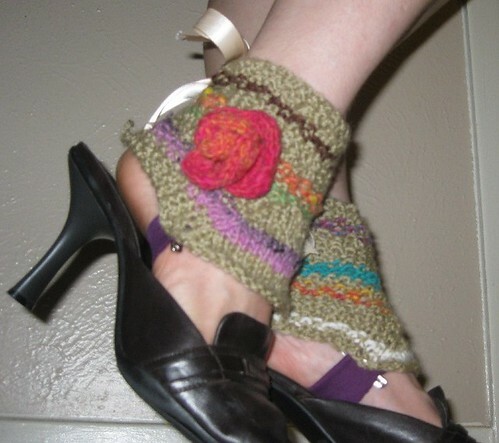 Or you can just have me knit something for you!